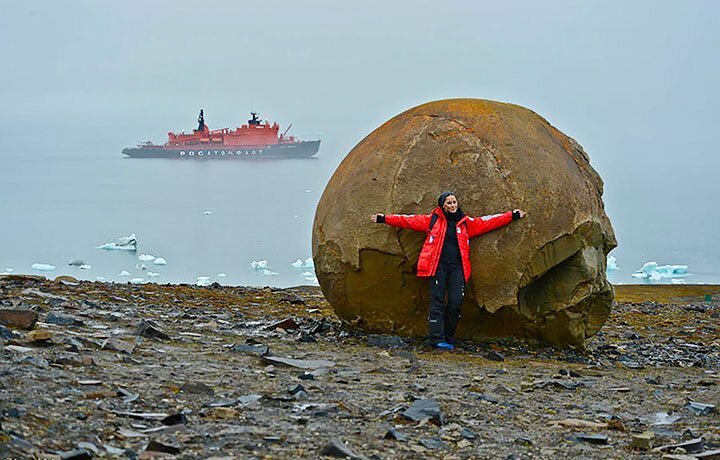 Large natural balls in the Franz Josef archipelago leave scientists flummoxed. Visitors to this cosmic landscape named the round rocks ‘footballs of the Gods’. 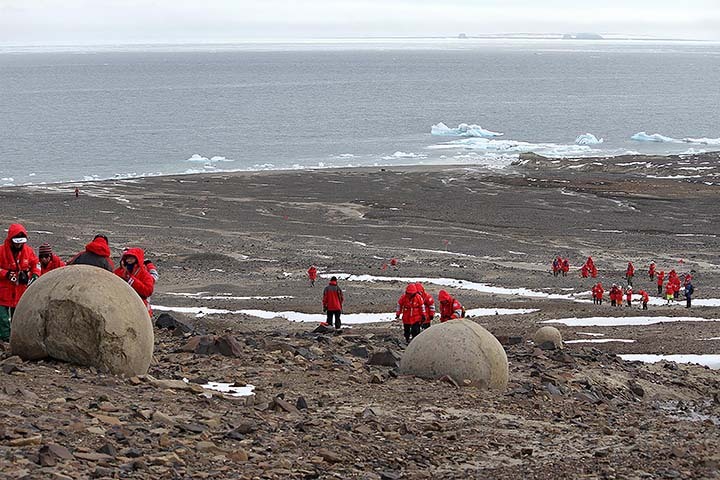 The huge stone balls up to two metres in height are found on appropriately-named Champ island above the polar circle. Perfectly spherical they are scattered all over this northern uninhabited outpost. And at first it is hard to believe that they are natural and not made by man, or possibly giants. This is where the giants or gods play football / soccer. 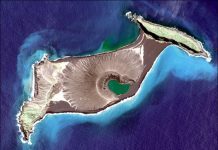 Yet the barren 374 km2 (144 sq miles) island was never inhabited and scientists are sure they are not artificial, even if they cannot agree how they were formed. 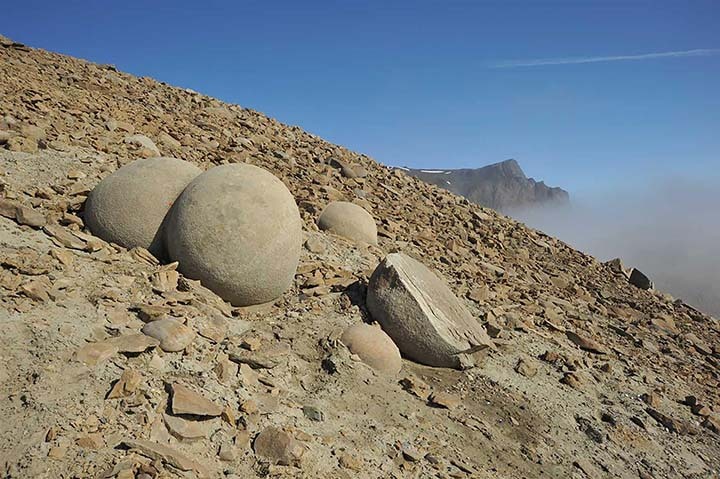 The huge stone balls up to two metres in height are found on Champ island above the polar circle. And what is in the center of this strange rock ball? 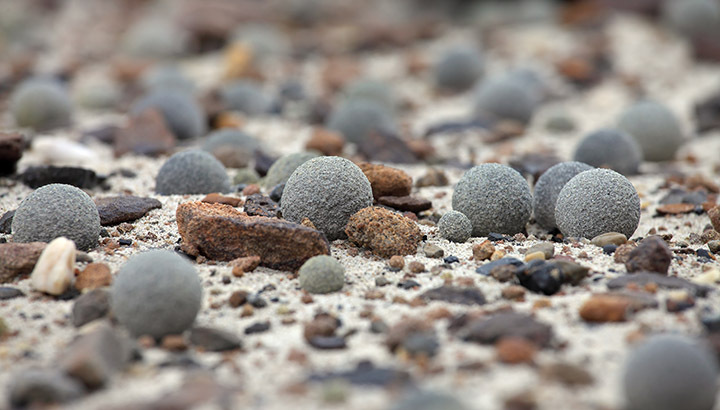 Similar but smaller stone balls were found last year on Heiss island in the same archipelago. Were these strange round rocks formed underwater? 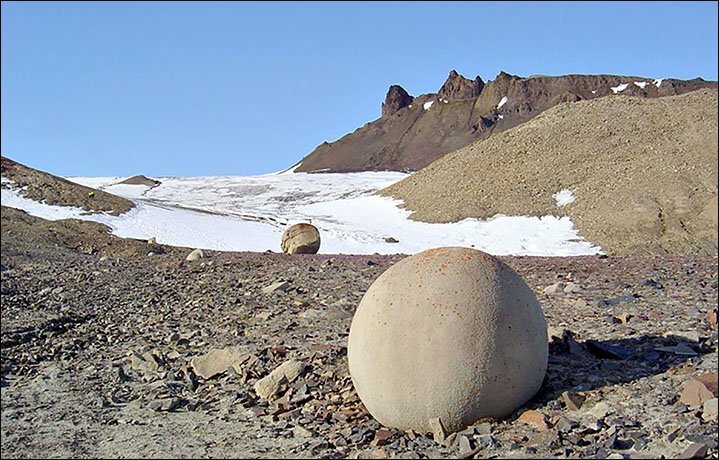 Similar unexplained rock spheres are found in different regions around the world. 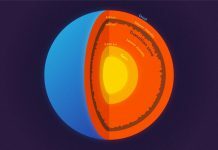 Yet Austrian geologist Sepp Fridhubera claimed the rounded shapes of the rocks were formed underwater and they have an organic core in the centre. 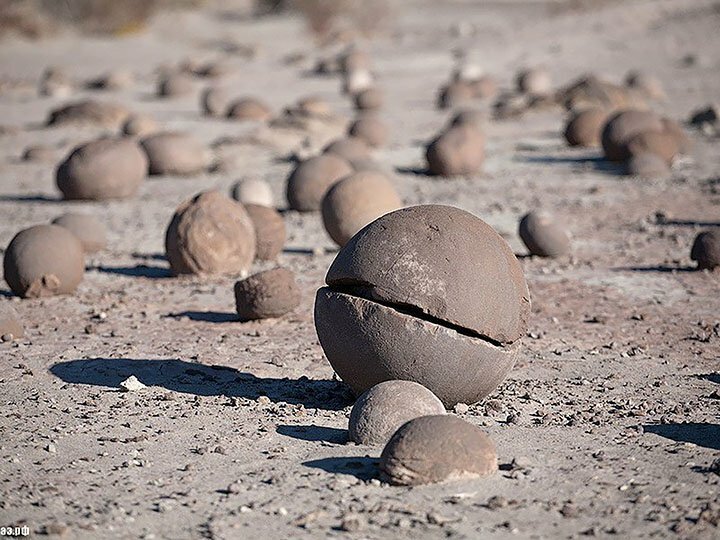 Scientists are sure the mysterious stone spheres are not artificial, even if they cannot agree how they were formed. 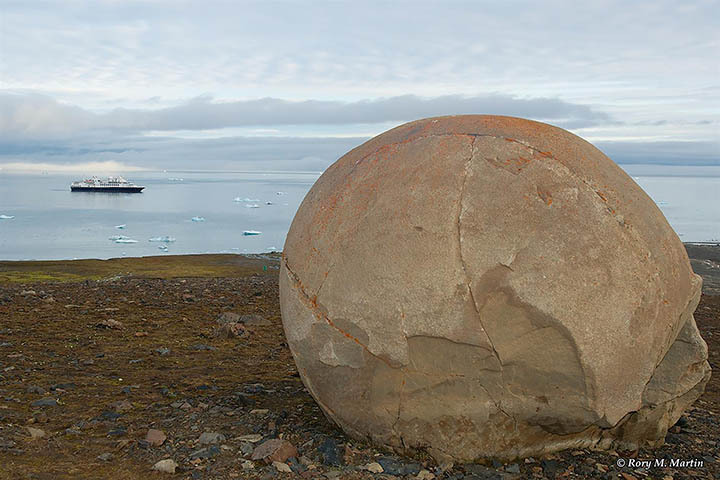 The giant balls are found on Champ Island, a 374 km2 (144 sq miles) island that was never inhabited. Champ island is named after William S. Champ, a representative of American industrialist William Ziegler who funded a number of pioneering 19th century Arctic explorations. Heiss is a Germanised version of the name Hayes. Isaac Israel Hayes, also American, was an Arctic explorer. 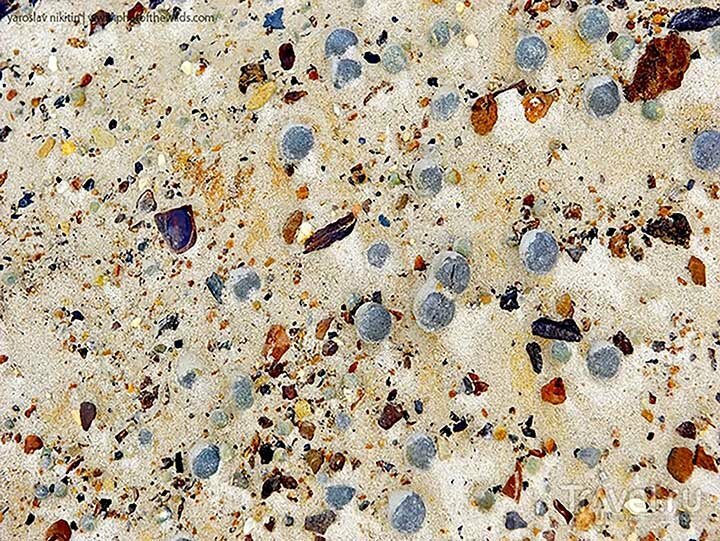 Similar round stones were discovered in Volgograd, New Zealand, China, Bosnia, and South Africa. 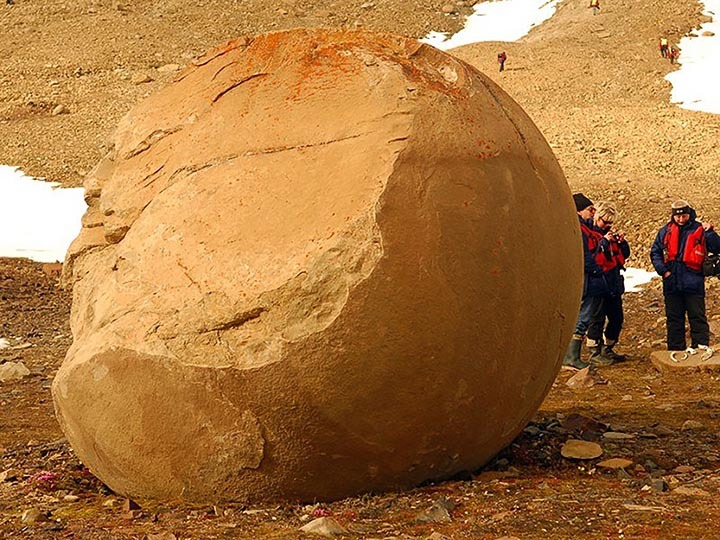 Another unexplained nature phenomenon in a remote area around the world. WOW! I want to go there! 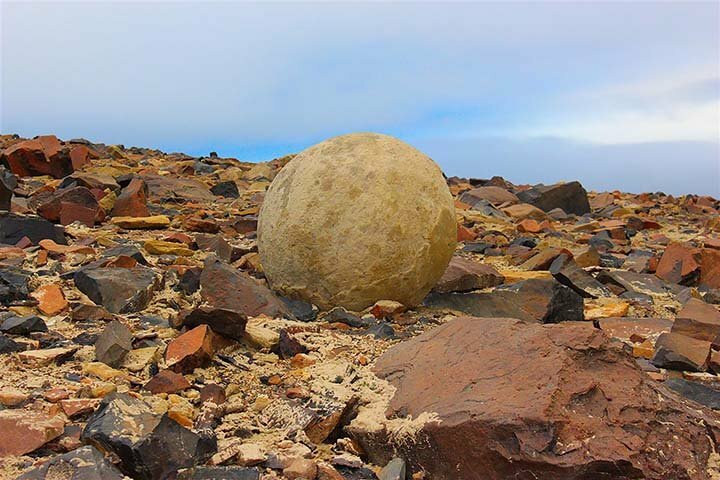 These rock spheres are amazing! But NO SNOW or ICE on “Champ island above the POLAR circle” is more amazing! Usually those rock balls are covered by ice and snow. 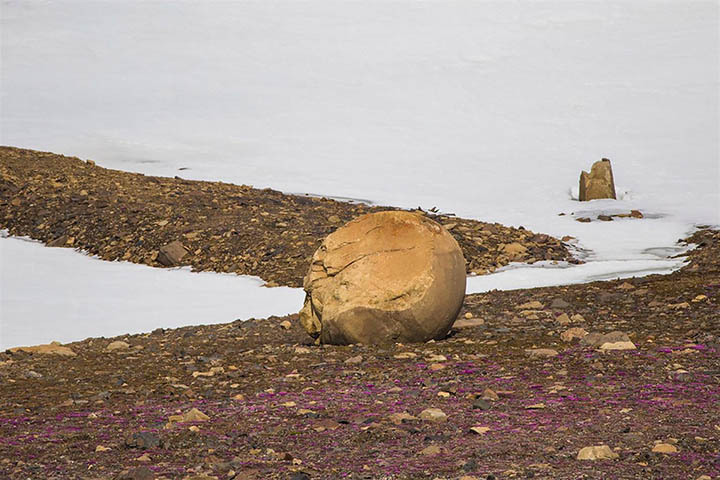 After those ice and snow melt, those rock balls started be appeared. This Champ Island is almost right on the North Pole. So there is almost NO ice and snow in North Pole, guys! Today’s Intellicast Radar shows the temperature of north tip of Greenland where is also POLAR circle, 54 degree (12 degree in celsius). With this kind of temperature, of course, all the ice will melt! In Sweden, they have the record high temperature 86 degree (30 degree in celsius!) in north side of their country where is almost POLAR region. They declared state of emergency for so many uncontrollable wildfires (actually Galactic Federation of Light’s secret reptilian underground base cleaning up operation). I tell you after all these ice and snow in both POLAR regions melt, much more water circulating the Earth, of course, we have more dramatic flood everywhere. Starting at 0:05 on the video above, you can see a beautiful pinkish UFO in the thick smoke. I know this area. It was more than 10 years ago, but I walked along this Deschutes river right there. What I felt very strange about this area along this river was that there was a nice unpaved road along Deschutes river for tens of miles, but it is only accessible ON FOOT. Who can walk tens of miles along this river? So it is basically this area is OFF LIMIT to people. Only people (of course, reptilians) who can access this area by car are who have access to the key to unlock the gate where is located the State Recreation Area near the highway. Yes, right now, Galactic Federation of Light is cleaning up the Reptilian Secret Underground Base in this area by burning! hail = ice bombs! from the heaven. Flagstaff, Arizona is one of the Reptilian Hot Spots. Where human disguising reptilians are gathering, where disasters hit. Search for UFOs tonight. You can easily find them. Take a video and post it on Youtube! Rabbi Yoram Mauda, director of Colel Chabad in Safed, told Chabad.org that 10 buildings were completely destroyed in the fire, while many others were damaged. On this video, you can see many cloudships (Spaceships disguising as clouds). Especially one cloudship starting at 4:12 looks so beautiful. It shapes like a spaceship, doesn’t it? Spaceships of Galactic Federation of Light are busy cleaning up the Earth. Many wildfires are popping up in Texsas. This morning, Galactic Federation of Light exploded New York City Reptilian Secret Underground Base! The explosion happened just under the Reptilian entity’s building which has the golden dome on the top. I’ve found out this Reptilian entity’s building is HSBC Bank. The headquarter is London, UK. Of course, this building has been connected to their secret underground bases and passages which was exploded this morning by Galactic Federation of Light. The location of this Explosion on Google Map (Street view). More than 1 year after the huge landslide in Big Sur, California, Highway 1 is finally open. But the slope looks still dangerous. 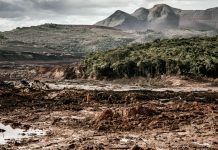 When they have lots of rain, I am sure that they are going to have another huge landslide. The ice and the water …. does those things. The ice and the water ….. does those things. There are so many creepy abandoned buildings all over the Earth. Reptilians who own those buildings rarely demolish them. Rather, they keep those rundown buildings for satanic rituals (killing human children for sacrifice). No wonder Galactic Federation of Light burnt down the building. Satanist leads prayer at Pensacola council meeting. A Satanist leads the invocation at a city council meeting in Pensacola, Florida.